Heat oil in a large saucepan over medium heat and add rice. Cook, stirring constantly, until puffed and golden. While rice is cooking, sprinkle with salt and cumin. Stir in onions and cook until tender. Stir in bay leaf, tomato sauce and chicken broth; bring to a boil. Reduce heat to low, cover and simmer for 20 to 25 minutes. Fluff with a fork and remove bay leaf when done. 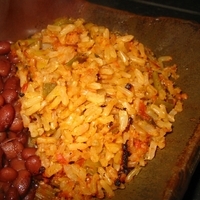 This is a simple recipe that is much more flavorful than any mexican rice I've had in a restaurant. I made it once and liked it and remade it with a little more onion, a half a bay leaf and used olive oil. Now it is something I will make on a regular basis. Super tasting and super easy! Who in asia would not want to learn a different variety of rice dish? Of course I like to too! This sounds delicious...!